Manfred Mann's Earth Band is an English rock band formed by South African musician Manfred Mann. Their hits include covers of Bruce Springsteen's "For You", "Blinded by the Light" and "Spirit in the Night". After forming in 1971 and despite a short hiatus in the late 1980s/early 1990s, the Earth Band continues to perform and tour. 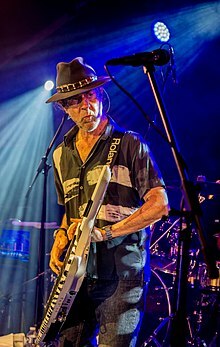 Keyboardist Manfred Mann started in the 1960s with the self-titled band that had such hits as "Do Wah Diddy Diddy" and Bob Dylan's "The Mighty Quinn" and then moved on to jazz fusion-inspired Manfred Mann Chapter Three before forming the Earth Band in 1971. In his 2003 autobiography, Klaus Voormann, an associate of the Beatles and a former member of the group Manfred Mann, alleges to have inspired the Earth Band's name by having suggested several times throughout the 1960s that Mann's soft pop style of those days had to become "earthier" and rockier, not least because of the seemingly effeminate image of Mann's earlier band which had led to a number of close encounters with violence, particularly in Ireland. According to the officially approved version, however, the name was chosen at the suggestion of drummer Chris Slade in September 1971, and is related to the ecological movement ongoing at the time. 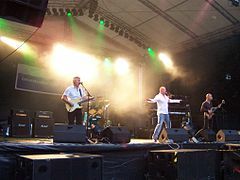 The original line-up consisted of Mick Rogers (guitar and vocals), Manfred Mann (organ, synthesizer and vocals), Colin Pattenden (bass guitar) and Chris Slade (drums and vocals). In its very earliest stages, the band was simply billed as "Manfred Mann" and thus a continuation of the 1960s group. The quartet released their first single, "Please Mrs. Henry", in 1971. Their second single, Randy Newman's "Living Without You", was also released by "Manfred Mann" in Europe, but by "Manfred Mann's Earth Band" in the USA, where the track became a minor chart hit. On two non-charting single releases in the UK in 1972/73, the group was billed simply as "Earth Band", but otherwise, from 1972 forward "Manfred Mann's Earth Band" was the band name used on all releases. The membership of the Earth Band was stable between 1971 and 1976, during which time they released their first six albums. Mann's interest in English 20th century classical music saw him adapt Gustav Holst's Planets Suite and turn a version of the "Jupiter" movement into a UK hit entitled Joybringer (included on the 1973 album Solar Fire). Other classical music adaptations include "Questions" from the 1976 album The Roaring Silence (which is based on the main theme of Franz Schubert's Impromptu in G flat Major), "Solar Fire is in Earth, the Circle, Pt. 1" (which uses the melody from Claude Debussy's Jimbo's Lullaby), and "Starbird" also from 1976's The Roaring Silence (which is based upon Igor Stravinski's ballet The Firebird). The title song to 1973's Messin' (written by Mike Hugg, and originally recorded by Chapter Three on their unissued third album), as well as most of the album The Good Earth tapped into ecological concerns, a recurring theme in Mann's music in later years, with The Good Earth giving away a free gift of a piece of land in Wales with each album sold. Like other prog-rock acts, the band also issued concept albums on space and sci-fi themes (particularly the album Solar Fire and the singles "Launching Place" off The Good Earth and "Starbird" off The Roaring Silence) and religious or biblical imagery ("Prayer" on the band's debut album, "Buddah" on Messin', Dylan's "Father of Day, Father of Night" and "In the Beginning, Darkness" on Solar Fire, "The Road to Babylon" and "This Side of Paradise" on The Roaring Silence, "Resurrection" on Angel Station). Social criticism was also addressed ("Black and Blue" on Messin' dealt particularly with slavery, and "Chicago Institute" on Watch with mental institutions and science as a mean of social control); a trend which grew throughout the 1980s, with songs such as Lies (through the 80s) on technological progress vs. social setbacks on Chance, and with Mann's growing involvement with the anti-apartheid movement which was featured on the 1982 album Somewhere in Afrika. Mann's intention for acknowledgement of oppressed ethnic groups also influenced the 1992 album Plains Music which featured traditional Native American music. The group's sixth album, 1975's Nightingales & Bombers, took its title from a World War II naturalist's recording of a nightingale singing in a garden as warplanes flew overhead; the recording appears in a track on the album (the US version included an extra track, a cover of Bob Dylan's; 'Quit Your Low Down Ways' sung by Mick Rogers). The US breakthrough for the band came in the third week of February 1977, when they charted at No. 1 on the Billboard Hot 100 with a cover of Bruce Springsteen's "Blinded by the Light" from The Roaring Silence. Before this hit, Mick Rogers had left the band (after Nightingales & Bombers) and Chris Thompson (lead vocals, guitar) and Dave Flett (Lead guitar, backing vocals) had been quickly recruited to replace him (although Rogers still contributed backing vocals to the album). The Roaring Silence also featured a guest appearance by jazz saxophonist Barbara Thompson, and the album Watch included two stand-out recordings from the band's live performances of "Davy's on the Road Again" and "Mighty Quinn". Taking advantage of the publicity of their hit song, the band re-released another Springsteen song, "Spirit in the Night", re-titled "Spirits In The Night", which the band had released the previous year on Nightingales & Bombers, in a vocally re-cut version with Chris Thompson taking a new lead vocal in place of Mick Rogers' vocal on the original album version. Following this popular success, the Earth Band released Watch, which produced another hit single in "Davy's on the Road Again". Drummer Chris Slade and Dave Flett left before 1979's Angel Station. Flett was replaced by guitarist Steve Waller, who shared lead vocals with Thompson. Geoff Britton played drums on the album but was soon replaced by John Lingwood, due to illness. 1980's Chance showed a move towards a more electronic approach and produced several cuts that were hits in the UK and/or saw significant airplay in both the US and UK. The songs "Lies (All Through The 80's)" sung by Thompson," "Stranded," and "For You" (another Springsteen song sung by Thompson) still. Trevor Rabin, a fellow South African and London session musician, and lead guitarist of the 1980s version of Yes, guested on the album. In 1984, the band issued the single "Runner", a cover of the song by Ian Thomas, which had been written in response to cancer sufferer Terry Fox and his run across Canada for cancer awareness...Fox had succumbed to the cancer before finishing. The Manfred Mann version featured Thompson on lead vocals and Mick Rogers on backing vocals. The song was a non-LP single in the UK but was included on the US release of Somewhere in Afrika. It was a top 40 hit in both Canada and the US and was used during ABC's broadcasting of the 1984 Summer Olympics and in the film The Philadelphia Experiment. At 22 on the Hot 100 it was their biggest hit since "Blinded by the Light" and was the band's second highest-charting song, as well as their final US/UK chart single. In 1986, Thompson exited the group and Mick Rogers returned with both appearing on the album Criminal Tango. For 1987's Masque album, the band consisted solely of Mann, Rogers, and drummer John Lingwood. Shortly thereafter, the Earth Band name was retired for a number of years. Manfred Mann's Earth Band was revived in the early 1990s and resumed recording, covering tracks by artists as varied as Paul Weller, Robert Cray, Del Amitri, and The Lovin' Spoonful. Mann has also released solo projects including Plains Music, which was based on Native American music, and 2006, which includes collaborations with the German rapper Thomas D and tracks featuring the music of, amongst others, the Super Furry Animals. The Earth Band has had a fluctuating line-up, with Mann being the only continuous member. The current line-up includes Mann and co-founder Mick Rogers. December 2006 saw the release of the DVD Unearthed 1973–2005 The Best of Manfred Mann's Earth Band. This features twenty tracks ranging from three recorded in Sweden in 1973 ("Father of Day", "Captain Bobby Stout" and "Black & Blue") to a 2005 performance of "Mighty Quinn". Also included are animations used during the band's live performances of the late 1970s and early 1980s and promo films (including two tracks from the Plains Music album). ^ John Trotter. "John Trotter – Drummer". Johntrotterdrums.com. Retrieved 25 June 2014. Wikimedia Commons has media related to Manfred Mann's Earth Band.